It's beginning to look a lot like Christmas, thrills in every store! 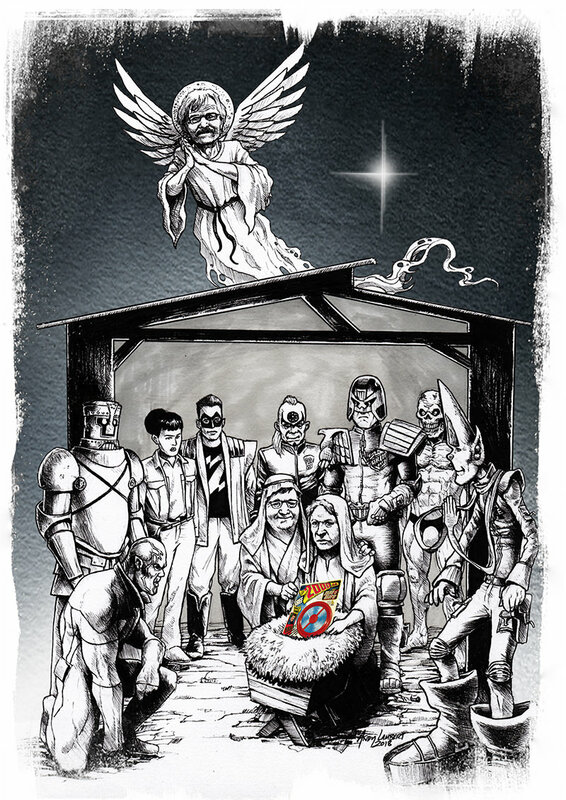 Oooooooh, it's here, the highlight of the year, welcome to the eighth 2000AD Advent Calendar 2018!!! Thanks in advance to everybody who signed up to the calendar, I can't wait to see what you come up with! Also, a massive thanks to all the folks who've contributed to the board this year, you all make my day, even the ones who have tantrums over my art comp entries! Real life means I can't get on here as often as I'd like but I do try and catch up at least once a day. MERRY CHRISTMAS AND GRUD BLESS US EVERYONE! Also, here's my back catalogue of shite 2000AD Christmas films - absolutely dire! Merry Christmas you lovely Squaxx!!! Over on the twitterverse I'm trying to make fetch happen. I mean Dreddcember. 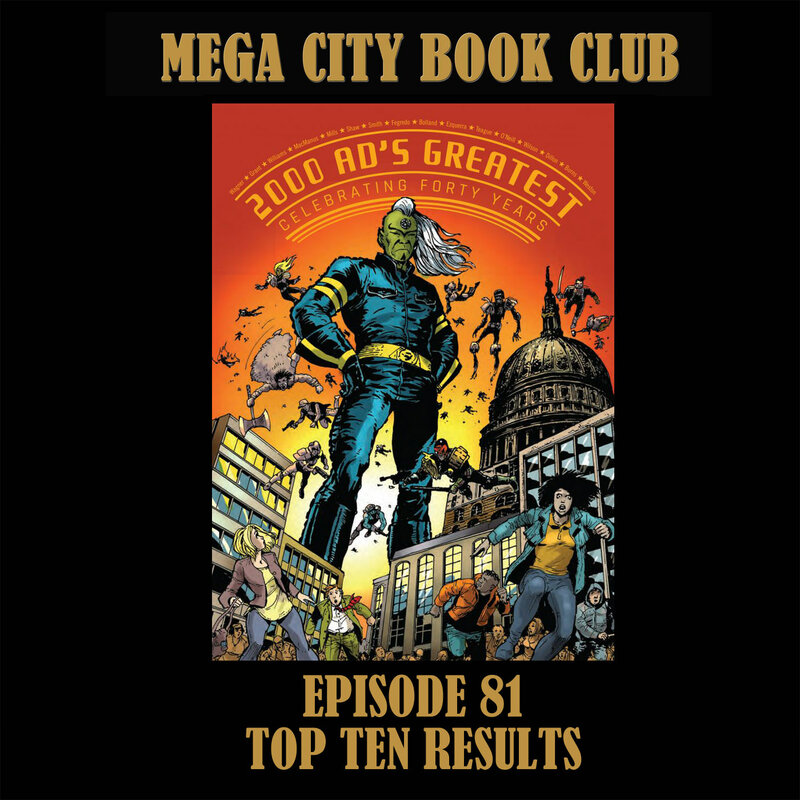 My first humble offering of the day is a podcast episode covering three top tens: Judge Dredd stories, non Dredd stories, and non Dredd thrills, as voted by you. I’ll be back later with a video. And here, literally hot off the press, is the video for this year's advent calendar charity raffle. There are four signed prizes. Please don't add gift aid because it's for a raffle ticket. Please do tick the box that allows me to contact you if you win. Scribbled on the train down from Bradford before it got too crowded. Been enjoying this the past few years so thought it was about time I contributed something. Hope you enjoy, and Merry Christmas! It was Christmas Eve and Dredd was patrolling Sector 40. The city was quiet aside from a few groups of late night revellers, some of whom Dredd had cuffed to holding posts for D&D. As Dredd was passing John McTiernan block, he glanced up to the roof and noticed a flurry of snow falling, localised only to the block. After checking with Weather Control that no snow was planned until the annual short burst the following day, Dredd parked his Lawmaster and made his way up to the roof. His tight boots made large footprints in the inch-deep covering. An illegal Weather Control disruptor was in the middle of the roof and Dredd was just about to blow it to smithereens with Hi-Ex when a juve walked out of the door behind him, stopping short when he saw the lawman. The juve hesitated, but then a look of defiance replaced the fear on his face. Dredd considered this. His city and people had been through hell more times than he could count, and he often felt ten times his age, despite the rejuves. Shouldn’t the citizens be allowed just some fleeting moments of happiness? With that, Dredd picked up the machine and returned to his Lawmaster, leaving the astonished juve staring after him. Maybe he was getting soft in his old age. “Now, Standard! Now, Hot Shot! Now Hi-Ex and Incendiary! On Dodge ‘em on Armor piercing, on stun shot and boot knife! To the perp’s head! 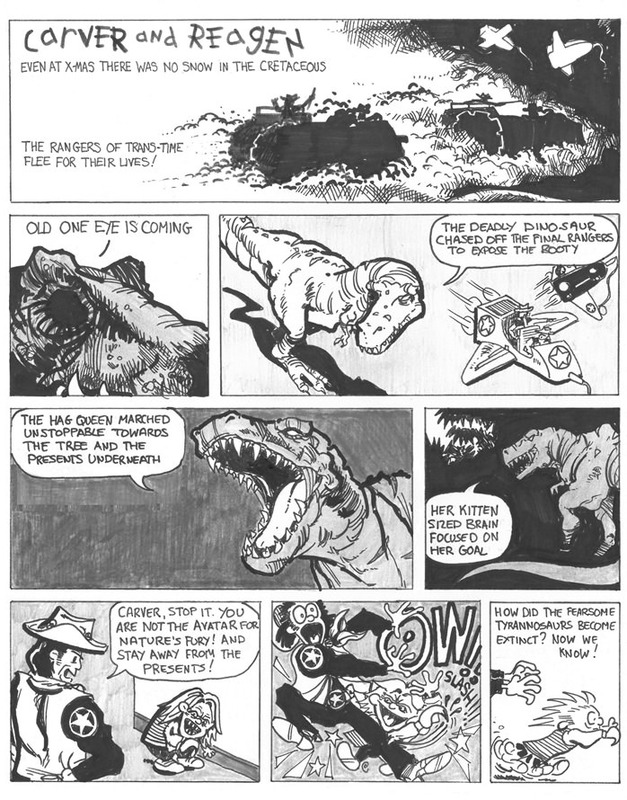 To the perp’s skull! The jail cells were emptying, even the juves! His armor-how it twinkled! His gun barrels how scary! His eyes glowed like roses, his mood set to bury! And back from behind, came the revived Judge Dredd! And the robot malfunctioned, like a bowl full of jelly. And I laughed when I saw it, in spite of myself. And beat up all the rioters, including the jerks! “Merry Christmas to all, you're going to Titan!" 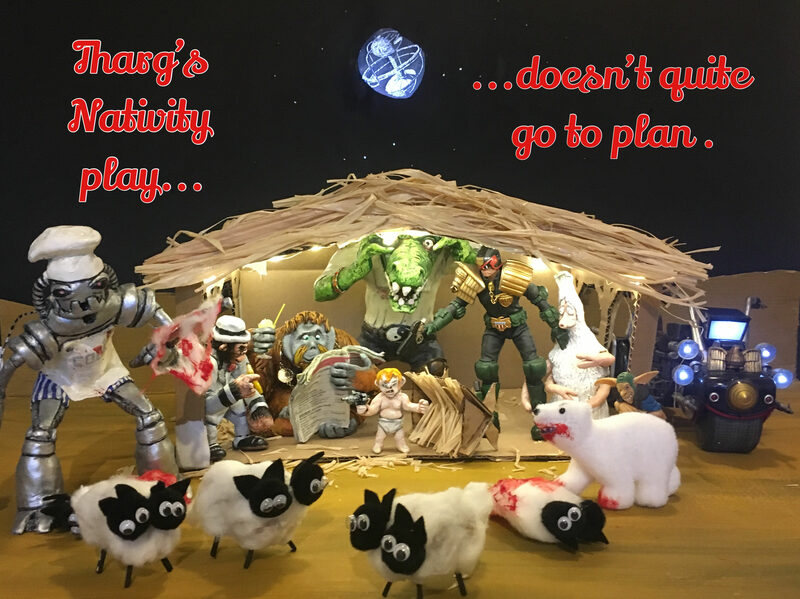 Merry Christmas, Squaxx - here's your second nativity scene of the year...!